This study examines how journalists interact with citizens, news sources, and other journalists on Twitter. The study compares practices of journalists who cover different beats (public affairs, sports, business/technology) and who work for different types of media (prestige newspapers, metropolitan newspapers, entrepreneurial websites). Sports journalists were more active on Twitter and interacted more with members of the public than did public affairs or business/technology journalists. Metro newspaper journalists were less active. However, various kinds of journalists were more alike than different in how they use Twitter, which suggests their practices might be influenced by a common journalistic culture. In a 30-day period in spring 2014, 27 journalists posted on Twitter on various topics: the controversy over the name of the professional football team in Washington, D.C., a chemical spill in West Virginia, Facebook, Starbucks, the stock market, the NBA Final, and a race horse named California Chrome. They exchanged congratulations to colleagues for new jobs, and they thanked readers for compliments on stories. Indeed, Twitter has become part of many journalists’ daily routine. It also has become a frequent research topic for media scholars, including some who have observed that journalists use it in ways consistent with gatekeeping and intermedia agenda-setting theories (e.g., Hermida, 2013; Lasorsa, Lewis, & Holton, 2012; Parmelee, 2013). The purpose of this content analysis is to extend that conversation by exploring how different kinds of journalists use Twitter to interact with other journalists, news sources, and the public. Specifically, this study compares and contrasts Twitter practices of journalists who specialize in public affairs, sports, and business/technology news. It also compares and contrasts practices of journalists from prestige newspapers (e.g., The New York Times), metropolitan newspapers (e.g., The Denver Post), and entrepreneurial news websites (sites founded with venture capital backing, e.g., Business Insider). Twitter has emerged as an important platform for disseminating news (Hermida, 2013). Journalists and news sources use Twitter to share information with the public. As a social media platform, Twitter has unique characteristics based on its founding in 2006 as a means of sharing short text messages on cellphones (Hermida, 2013). The text of Twitter posts is limited to 140 characters, but users can attach multimedia or share links to Web content (Bruns & Burgess, 2012). They can forward tweets from other users to their followers in the form of “retweets” or “RTs.” Users can send retweets without modification, or they can add their own commentary. Users also can reply to posts or flag other users by mentioning their usernames preceded by the “@” symbol (Bruns & Burgess, 2012; Lasora, Lewis, & Holton, 2012). A majority of U.S. journalists use social media to look for breaking news, monitor other news media, search for story ideas, interact with audiences, and find more information or sources for stories (Willnat & Weaver, 2014). Twitter has become a more routine reporting tool than other social media in part because journalists can maintain a “disinterested stance” (Reed, 2013, p. 568) when they follow news sources. By contrast, Facebook requires a reciprocal “friends” relationship, which can violate journalists’ “personal and professional boundaries” (Reed, 2013, pg. 568). About half of Twitter users view the service as a news source, and they are less likely to turn to print newspapers, television, or radio for news than users of other social media (Holcomb, Gottfried, & Mitchell, 2013). Twitter is a more prominent news source for younger users and those who have more education and higher incomes (Holcomb et al., 2013). Twitter allows citizens to interact with journalists to be “involved in the flow, framing and interpretation of news” (Hermida, 2013, p. 304). However, interaction with the public and newsmakers challenges journalists’ traditional role as gatekeepers who determine which information gets passed along to audiences (Hermida, 2013; Parmelee, 2013). Previous research has suggested journalists interact more with each other on Twitter than with news sources or the public. For example, a content analysis of tweets by journalists for four large legacy newspapers and four online news sites found journalists were more likely to interact during the 2013 U.S. federal government shutdown with other journalists than with political sources or citizens (Russell, Hendricks, Choi, & Stephens, 2015). Furthermore, journalists and news media use Twitter as a promotional tool to direct readers to articles posted on their websites (Armstrong & Gao, 2013; Lasorsa et al., 2012; Russell et al., 2015). Twitter helps journalists do their jobs, but adds to their responsibilities (Parmelee, 2013). Journalists believe pressure to provide news quickly on Twitter comes at the expense of accuracy (Kian & Murray, 2014; Willnat & Weaver, 2014). Sportswriters feel pressure to break news and be active on Twitter (Kian & Murray, 2014). Sportswriters believe it is necessary to follow team owners, players, and other journalists (Kian & Murray, 2014; Reed, 2013). At the same time, sportswriters appreciate that Twitter allows them to interact directly with readers and that their posts can reach an audience beyond a specific region (Kian & Murray, 2014). As for business journalists, Lariscy, Avery, Sweetser, and Howes (2009) surveyed 200 journalists, including reporters for influential financial publications, to find they were not fully adopting social media as a reporting tool. However, the authors noted Twitter’s potential for public relations practitioners to interact with reporters. Given that Twitter is increasingly part of journalists’ work routines, it is possible that business journalists have become more active on this platform since the Lariscy et al. (2009) analysis. For clarity, this study refers to “business/technology” as a news topic because financial journalists prominently cover technology companies such as Apple, Google, Twitter, and Facebook (Pew Research Center’s Project for Excellence in Journalism, 2010). Most newspapers in this study had business reporters dedicated to technology coverage, and technology news sites are among entrepreneurial media that have received venture capital funding. This study considers journalists’ Twitter use from gatekeeping and intermedia agenda-setting perspectives. Retweets serve a gatekeeping function because they reflect journalists’ decisions to forward information to followers (Lasorsa et al., 2012). Gatekeeping theory suggests external and organizational pressures influence journalists’ news decisions (Shoemaker & Vos, 2009). In particular, journalists are influenced by news sources such as public relations practitioners (who provide information subsidies that reduce the cost of reporting news), other journalists, and the social and economic environment in which they operate (Cameron, Sallot, & Curtin, 1997; Carroll & McCombs, 2003; Shoemaker & Vos, 2009). Journalists have mixed feelings about information subsidies. Many journalists are skeptical of commercially motivated messages, but financial journalists are willing to accept such messages when they come from established businesses with favorable reputations (Carroll & McCombs, 2003). Intermedia agenda-setting theory suggests other media heavily influence journalists’ news decisions. For example, health journalists reported that other journalists had a stronger effect on their story choices than public relations sources (Len-Ríos et al., 2009). Four newspapers, The New York Times, The Washington Post, The Wall Street Journal, and the Los Angeles Times, have been identified as especially influential on other news media (Danielian & Reese, 1989; Golan, 2006; Heim, 2011; Meraz, 2009; Reese & Danielian, 1989). This previous research suggests it is possible that journalists from these prestige newspapers and their counterparts from metropolitan daily newspapers face different kinds of organizational and external pressures, which would affect their Twitter use. For that reason, this study examines how prestige newspaper journalists and metro newspaper journalists use this platform. Indeed, a content analysis of more than 22,000 tweets by 430 journalists found differences in the nature of posts by elite and non-elite media (Lasorsa et al., 2012). Members of elite media comprising national newspapers, broadcast networks, and cable channels “were less inclined to share opinions, engage readers, and so forth” (Lasorsa et al., 2012, p. 31) on Twitter. The authors posited that journalists who work for local media would need “to be more active and interesting on Twitter” (Lasorsa et al., 2012, p. 31) than journalists who could draw followers based on their elite media status. Much research involving intermedia agenda-setting occurred before the Internet and social media emerged as news platforms. Newspapers formerly dominated their markets, but much of the news audience now prefers digital sources (Pavlik, 2013). This study specifically considers online news sites that have received funding from venture capital firms because entrepreneurship scholars have noted the role of these financial intermediaries in technological innovation (Chemmanur & Fulghieri, 2014; Shane & Cable, 2002). Entrepreneurial news websites could have their own organizational and external pressures that influence how their journalists use Twitter. Although prestige and metro newspapers and online news sites operate in different environments, they share an important similarity. In capitalistic economies, news media must attract an audience that pays for content or draws advertiser attention (Napoli, 2001; Shoemaker & Reese, 1996). Journalists have adopted Twitter as a means for reaching that audience, but the platform has its own “sociotechnical dynamics” (Hermida, 2013, p. 306) that influence news routines and practices. Taken as a whole, this interplay of external and organizational pressures on journalists’ news decisions suggests different kinds of journalists might use Twitter in different ways. RQ2. How do journalists who work for different types of media (prestige newspapers, metropolitan newspapers, entrepreneurial news sites) interact with other journalists, news sources, and the public on Twitter? Many previous studies of journalists’ Twitter use focused on early adopters or prolific users, but recent studies have suggested the platform has become a normal part of journalists’ work routines (Hermida, 2013; Lasorsa et al., 2012). For that reason, this study examines tweets from journalists who are both active and less frequent Twitter users. A combination of random and purposive sampling ensured that tweets from different kinds of journalists were represented. However, this sampling strategy required accepting that any conclusions reached would not be fully generalizable to all journalists. The sample was compiled in three steps starting with a purposive sample of news organizations. Four prestige newspapers identified in previous research (the Los Angeles Times, The New York Times, The Wall Street Journal, and The Washington Post) were selected. Next, 10 U.S. metropolitan daily newspapers were chosen by identifying the largest based on circulation reported to the Alliance for Audited Media. Newspapers published in the same metropolitan area as a prestige newspaper or a larger metro newspaper were excluded to ensure a geographically diverse sample. Finally, 10 entrepreneurial news websites were chosen by conducting Google and Lexis-Nexis searches for news coverage of online media companies that received venture capital investments. Sites were chosen only from among the 1,000 most popular U.S. websites as ranked by Alexa.com. Next, a stratified sample of Twitter accounts was selected. The researcher examined lists from the news organizations’ main Twitter accounts to find journalists whose profile descriptions indicated they cover public affairs, sports, or business/technology news. From this list, the researcher randomly selected three each of nine types of journalists: prestige public affairs, prestige sports, prestige business/technology, metro public affairs, metro sports, metro business/technology, entrepreneurial public affairs, entrepreneurial sports, entrepreneurial business/technology (see Table 1). Journalists who did not post at least an average of once a day over a 30-day period from May 9 to June 7, 2014, were excluded. Finally, TwimeMachine was used to collect Twitter posts for each of the journalists from this period. From these posts (n = 15,230), a random sample of tweets was selected. Some journalists posted multiple times daily. To make sure enough tweets by different types of journalists remained for analysis, the number of posts by any one journalist was limited to 5% (n = 45) of the sample. As tweets were removed from journalists more active on Twitter, tweets were randomly selected from other accounts until the sample (n = 900) was complete. Two trained independent coders, both communication doctoral students, examined the tweets and classified the dependent variables based on a codebook developed by the researcher. Each coder examined 495 tweets, resulting in an overlap of 10% (n = 90) of the sample. The coders achieved sufficient agreement on the dependent variables reported in this study. Specific reliability statistics are reported along with the descriptions of the dependent variables. For the tweets examined by both coders, the researcher randomly selected between the coders’ cases to compile the final sample. This study has two independent variables: beat (public affairs, sports, business/ technology) and type of news media (prestige newspaper, metropolitan newspaper, entrepreneurial news website). This study has five dependent variables that were categorized by the coders: Source of retweet was categorized as same news outlet, other news media, official information source, public, unclear, or no retweet. The coders achieved sufficient agreement (Krippendorff’s α = .82) based on the standard suggested by Krippendorff (2013) that an alpha of at least .8 indicates reliability and that an alpha of at least .667 may be used to reach tentative conclusions. Presence of addition to retweet was categorized as yes, no, or no retweet. The coders agreed on this variable (α = 1). Source of first @mention was categorized as same news outlet, other news media, official information source, public, unclear, or no @mention. The coders achieved agreement on the high end of the range for reaching tentative conclusions (α = .78). In categorizing @mentions, coders were asked to only consider text from the journalist and to ignore @mentions that were part of retweets. This allowed for separate consideration of @mentions that involved interactions intended by the journalist rather than indirect interactions such as those in retweeted text. Source of second @mention was categorized as same news outlet, other news media, official information source, public, unclear, or no second @mention (α = .85). Source of third @mention was categorized as same news outlet, other news media, official information source, public, unclear, or no third @mention (α = 1). Tweets with more than three @mentions were rare. Specifically, 1% (n = 10) had four or more @mentions. These additional @mentions were excluded because too few existed for meaningful statistical analysis. Based on the variables categorized by the coders, three additional dependent variables were created: presence of retweet (yes or no), presence of @mention (yes or no), and presence of retweet or @mention (yes or no). Chi-square goodness of fit tests were conducted to determine whether statistically significant differences occurred in the number of tweets based on each of the categories of the two independent variables (journalist’s beat and type of news media). Chi-square tests of independence were used to compare the independent variables against each of the dependent variables (presence of retweet or @mention, presence of retweet, source of retweet, presence of addition to retweet, presence of @mention, source of first @ mention, source of second @mention, and source of third @mention). Initial analyses of the source of second @mention variable and the initial comparison of source of retweet against type of media violated an assumption of chi-square tests because too many contingency table cells had an expected count of less than 5. For most of these comparisons, it was possible to conduct a chi-square test with no more than 20% of the cells containing an expected count of less than 5 by removing the “unclear” category. For consistency, the “unclear” category was removed for source of retweet, source of first @mention, and source of second @mention variables. The coders categorized about 1% (n = 7) of the tweets as “unclear” for the source of retweet variable, 2% (n = 21) for the source of first @mention variable, and less than 1% (n = 3) for the source of second @mention variable. Even after dropping the “unclear” category, it was not possible to meet chi-square test assumptions for the comparison of type of media and source of second @mention. However, it was possible to conduct this comparison by combining “official information source” and “public” categories of source of second @mention into a new “non-journalist” category. Finally, source of third @mention analyses also violated chi-square assumptions, and it was not possible to remove or combine categories in a relevant way. For that reason, this variable was dropped. About 3% (n = 26) of the tweets had a third @mention. The first research question concerned how journalists with different beats interact with other journalists, news sources, and the public on Twitter. A one-sample chi-square goodness of fit test indicated that a statistically significant difference, χ2(2, N = 900) = 16.51, p < .001, existed among the proportions of tweets by sports journalists (39%, n = 354), public affairs journalists (32%, n = 290), and business/technology journalists (28%, n = 254). Presence of retweet or @mention. About two-thirds of the tweets contained either a retweet or at least one @mention. The difference in the proportion of Twitter posts with either a retweet or at least one @mention by public affairs, sports, and business/ technology journalists approached significance (see Table 2). Adjusted standardized residuals (ASRs) showed sports journalists had a lower proportion of Twitter posts with a retweet or @mention than the sample as a whole. Presence of retweet. More than 1 in 5 tweets in the sample contained a retweet. A significant difference existed in the proportion of Twitter posts with retweets by public affairs, sports, and business/technology journalists (see Table 3). ASRs showed a greater proportion of tweets by public affairs journalists and a lower proportion of tweets by sports journalists included a retweet. Source of retweet. 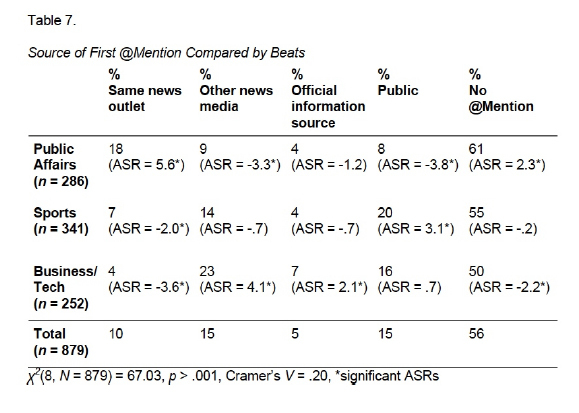 A significant difference existed in the sources of retweets among journalists with different beats (see Table 4). A greater proportion of tweets from public affairs journalists included retweets from other news media, and a lower proportion did not include retweets. Sports journalists had a lower proportion of tweets with retweets from other news media, and a greater proportion of tweets that did not include retweets. Addition to retweet. 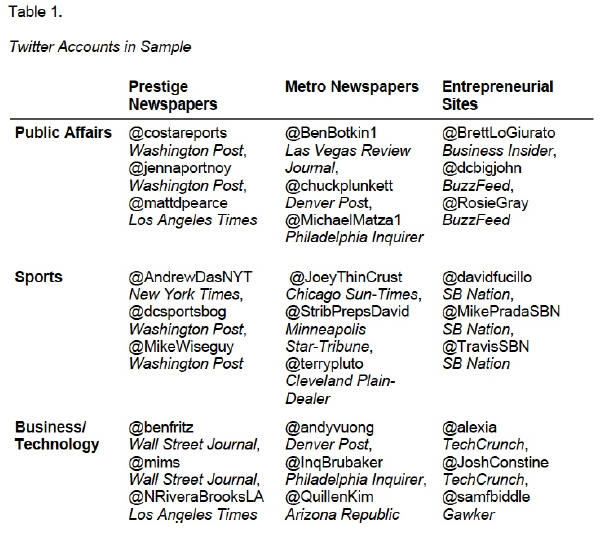 A significant difference in these categories of tweets existed among journalists with different beats (see Table 5). Public affairs journalists had a greater proportion of retweets without additional text, but mostly because they had a lower proportion of tweets without RTs. Sports journalists had a lower proportion of retweets without additional text, but mostly because they had a greater proportion of tweets without RTs. No significant difference existed from the sample in the proportions of tweets with text added to a retweet by public affairs and sports journalists, nor in any of the categories by business/tech journalists. Presence of @mention. Slightly less than half of the tweets included at least one @ mention. A difference existed in the proportions of tweets with at least one @mention by journalists with varying beats (see Table 6). Public affairs journalists included a lower proportion of tweets with at least one @mention. Business/tech journalists had a greater proportion of such tweets. Although sports journalists had the largest number of tweets with @mentions, the proportion did not differ significantly from the sample. Source of first @mention. A significant difference existed in the sources of first @mentions among journalists based on beats (see Table 7). Public affairs journalists had greater proportions of tweets with a first @mention from their own news organizations and of tweets without @mentions. They had lower proportions of tweets with a first @mention from other news media and from the public. Sports journalists had a lower proportion of tweets with a first @mention from their own news organizations and a greater proportion from the public. Business/tech journalists had a lower proportion of tweets with a first @mention from their own news organizations, greater proportions of tweets with a first @mention from other news media or official information sources, and a lower proportion of tweets without any @mentions. Source of second @mention. Second @mentions were rare in comparison to first @mentions; specifically, about 1 in 9 tweets included more than one @mention. A difference existed among journalists with different beats in the sources or lack of a second @mention (see Table 8). Public affairs journalists included a greater proportion of tweets with second @mentions from their own news organizations. Sports journalists included a lower proportion of such tweets. Business/tech journalists had a greater proportion of tweets with second @mentions from other news media. Taken together, the analyses showed differences in how public affairs, sports, and business/technology journalists used retweets and @mentions. Compared with tweets by the other journalists, a tweet by a public affairs journalist was more likely to include any retweet, a retweet of a post from other news media, or @mentions associated with the journalist’s own news organization. A public affairs journalist’s tweet was less likely to include an @mention, an @mention of other news media, or an @mention of the public. Sports journalists were most active on Twitter in terms of number of posts. Compared with other posts, a sports journalist’s tweet was less likely to include either form of interaction (retweet or @mention), any retweet, a retweet from other news media, or @mention of their own news organization. A sports journalist’s tweet was more likely to include an @mention of a member of the public. Business/technology journalists were least active on Twitter. Compared with other posts, a business/technology journalist’s tweet was more likely to include an @mention, @mention of other news media, or @ mention of an official information source. A business/technology journalist’s tweet was less likely to include an @mention associated with the journalist’s own news organization. The second research question concerned how journalists who work for different types of media interact with other journalists, news sources and the public on Twitter. A one-sample chi-square goodness of fit test showed a significant difference, χ2(2, N = 900) = 108.45, p < .001, existed in the proportion of tweets by journalists who work for entrepreneurial news sites (45%, n = 402), prestige newspapers (38%, n = 341), and metro newspapers (17%, n = 157). Presence of retweet or @mention; presence of retweet; presence of @mention. No significant difference existed in the proportion of Twitter posts with either a retweet or at least one @mention by journalists who worked for prestige newspapers, metro newspapers, or entrepreneurial news sites, χ2(2, N = 900) = 3.19, p = .20, Cramer’s V = .06. Furthermore, no significant difference existed among journalists from the three media types in the proportions of tweets with RTs, χ2(2, N = 900) = 3.87, p = .15, Cramer’s V = .07, nor in the proportion of tweets with @mentions, χ2(2, N = 900) = .17, p= .92, Cramer’s V = .01. Source of retweet. No significant difference existed among journalists from prestige newspapers, metro newspapers, and entrepreneurial news websites in the proportions of tweets with a retweet from the same news outlet, a retweet from other news media, a retweet from an official information source, a retweet from a member of the public, or no retweet, χ2(8, N = 893) = 12.97, p = .11, Cramer’s V = .09. 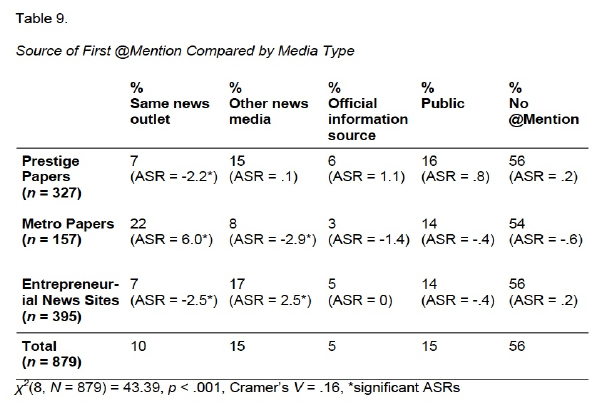 However, a significant adjusted standardized residual (ASR = 2.6) showed journalists from prestige newspapers had a greater proportion of tweets with RTs of a post from other news media than in the sample as a whole. Addition to retweet. No significant difference existed among journalists from the three media types in the proportions of Twitter posts with a retweet that included additional text by the journalist, that did not add anything to the retweeted post, or that did not include a retweet, χ2(4, N = 900) = 5.34, p = .25, Cramer’s V = .05. 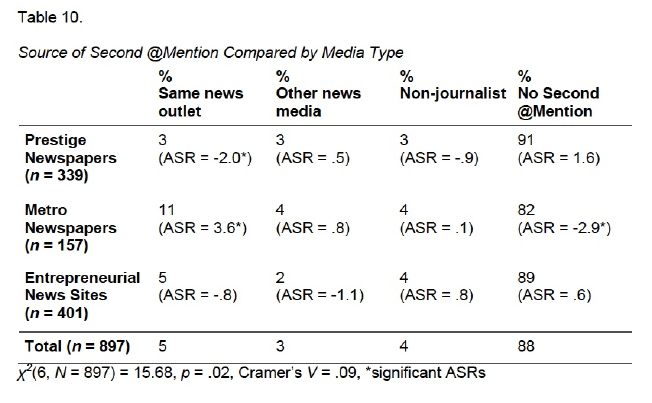 However, a significant adjusted standardized residual (ASR = -2.0) showed metro newspaper journalists had a lower proportion of posts that included a retweet without text added by the journalist than in the sample as a whole. Source of first @mention. A significant relationship existed among journalists who worked for prestige newspapers, metro newspapers, or entrepreneurial news websites in the categories of this variable (see Table 9). Prestige newspaper journalists had a lower proportion of tweets with first @mentions of Twitter accounts associated with their own news outlets than in the sample as a whole. Journalists for entrepreneurial news sites also had a lower proportion of such tweets. By contrast, metro newspaper journalists had a greater proportion of tweets with first @mentions associated with their own newspapers. Metro newspaper journalists had a lower proportion of tweets with first @mentions associated with other news media than in the overall sample. However, journalists from entrepreneurial sites had a greater proportion of first @mentions associated with other news media. Source of second @mention. “Official information source” and “public” categories were combined as “non-journalist” to meet chi-square test assumptions. A significant difference existed among the three media types in the categories of this variable (see Table 10). ASRs indicated prestige newspaper journalists had a lower proportion of posts with second @mentions associated with their own newspapers and metro newspaper journalists had a greater proportion of such posts than in the overall sample. Metro newspaper journalists had a lower proportion of posts that did not have at least two @mentions than in the overall sample. Taken together, fewer differences existed among news media types than among journalists’ beats. Compared with other posts, a prestige newspaper journalist’s tweet was less likely to include @mentions associated with the journalist’s own newspaper. Metro newspaper journalists were least active on Twitter in terms of number of posts. Compared with other posts, metro newspaper journalists’ tweets were more likely to include @mentions associated with the journalist’s newspaper and less likely to include @mentions of other news media. A metro newspaper journalist’s tweet was more likely to include more than one @mention. Journalists for entrepreneurial news websites were most active on Twitter. Compared with other tweets, a post by such a journalist was more likely to include an @mention of other news media and less likely to include an @mention associated with the journalist’s own news outlet. The study showed several differences in the uses of retweets and @mentions by public affairs, sports, and business/technology journalists. Public affairs journalists seemed especially careful in their use of Twitter, which is consistent with previous research finding journalists value balance or moderation in reporting (Gans, 1979), which has extended to political journalists’ use of Twitter (Parmelee, 2013). This result also is consistent with research finding journalists are careful not to direct readers to information viewed as lacking credibility (Coddington, 2014). A public affairs journalist’s post was more likely to include a retweet, suggesting these journalists perceive their role as passing on information to followers. By contrast, public affairs journalists’ posts were less likely to include @mentions, particularly those referring to other news media or members of the public. However, such a post was more likely to include an @mention associated with the same news organization. Sports editors, writers, and producers were more active on Twitter than public affairs or business/technology journalists, which is consistent with other studies of social media adoption by sport journalists (Kian & Murray, 2014; Reed, 2013). A sports journalist’s tweet was more likely to include an @mention referring to a member of the public, echoing previous research that found sportswriters value Twitter for its potential for direct reader connections (Kian & Murray, 2014). However, a sports journalist’s tweet was less likely to include interaction in the form of retweets, including those from other news media, perhaps reflecting the competitive pressure of this media platform. Business journalists were infrequent Twitter users in a previous study (Lariscy et al., 2009), and the business/technology journalists in the present study were less active on Twitter than public affairs and sports journalists. A business/technology journalist’s post was more likely to include an @mention from an official information source, which was consistent with research (Carroll & McCombs, 2003) that financial journalists are willing to accept information subsidies from established businesses with good reputations. Compared with differences by beat, this study revealed fewer differences among journalists who work for prestige newspapers, metro newspapers, and entrepreneurial websites in how they use retweets and @mentions on Twitter. However, metro newspaper journalists were more guarded in their Twitter use. They tended to tweet less frequently, and their posts were more likely to include @mentions from their own newspapers. This finding was contrary to the Lasorsa et al. (2012) suggestion that local journalists would need to be more lively on Twitter than elite journalists to gain an audience. Instead, metro newspaper journalists seemed more restrained. Such an approach might not help them gain audience attention, but it is consistent with other research. Digital competitors have especially challenged metro newspapers (Pavlik, 2013), leading to smaller staffs with less time to do more work, and some newspaper journalists consider Twitter a time-consuming distraction (Parmelee, 2013). Although statistical tests revealed differences in how various types of journalists use retweets and @mentions on Twitter, effect sizes were relatively small. This suggests journalists are more similar than different in their Twitter use, a conclusion consistent with previous research that journalists share a culture and professional values that influence work routines (Gans, 1979; Reese & Ballinger, 2001). For example, journalists typically have upper-middle-class, college-educated backgrounds. Many were initially exposed to this culture in journalism schools (Gans, 1979; Willnat & Weaver, 2014). They share values including accuracy, fairness, credibility, public service, immediacy, and autonomy (Deuze, 2005; Gans, 1979; Hayes, Singer, & Ceppos, 2007; Kovach & Rosenstiel, 2007). Future research should consider further how culture and values influence journalists’ Twitter use. As with similar research, this study has its limitations. Although this study offers insights into how journalists use retweets and @mentions, it does not consider more complex issues such as how Twitter use reflects journalists’ roles or responsibilities. Initially, coders attempted to determine whether tweets in this study were personal or reflected a journalistic role such as neutral/disseminator, participant/interpretive, participant/ adversarial, or participant/mobilizer (Johnstone, Slawski, & Bowman, 1972). However, coders did not achieve sufficient agreement. This occurred because many tweets occur within conversations between Twitter users, and it is not always possible to examine a single tweet in context. Furthermore, Twitter users can delete their posts, which also limits the ability to analyze tweets in context. Other methods could be useful for exploring this question. Specifically, textual analysis of tweets or interviews with journalists might help explain how journalistic roles are reflected in tweets. It also was a potential limitation that this study only concerned three beats and three media types. It could be worthwhile to explore how journalists with different beats (e.g., arts, crime, or general assignment) or who work for other types of media (e.g., broadcasters, magazines, or smaller newspapers) use Twitter. This study provided evidence of differences in how journalists use the retweet and @mention functions of Twitter depending on whether they cover public affairs, sports, or business/technology news, and whether they work for prestige newspapers, metro newspapers, or entrepreneurial news websites. However, the variations had relatively small effect sizes. This suggests journalists are mostly similar in how they use Twitter, potentially reflecting a common culture and professional values. Findings about how journalists interacted with other news media extend research demonstrating intermedia agenda-setting influences on how news media use Twitter. Findings relating to differences in journalists’ use of retweets have implications for gatekeeping theory. The conclusions also apply to journalistic practice in that different kinds of journalists could learn from each other in how they use Twitter. Indeed, scholars have noted the potential of Twitter and other social media to encourage meaningful dialogue between journalists and citizens (Gillmor, 2010; Mayer, 2011; Pavlik, 2013). Lewis, Holton, and Coddington (2014) have extended the idea of citizen participation in news construction with a new concept, “reciprocal journalism,” arguing that social media and other engagement tools should be used for exchanges benefiting both journalists and citizens. This dialogue won’t occur if journalists aren’t interacting with information sources and other citizens. Interaction with news sources could improve journalists’ use of Twitter as a reporting tool, and interaction with citizens could build a larger, more engaged news audience by strengthening connections between journalists and the public. The author is grateful to Grace Choi and Brandon Miller for their assistance with coding and to Elizabeth Behm-Morawitz and the anonymous reviewers for their feedback. Armstrong, C. L., & Gao, F. (2010). Now tweet this: How news organizations use Twitter. Electronic News, 4(4), 218-235. Bruns, A., & Burgess, J. (2012). Researching news discussion on Twitter: New methodologies. Journalism Studies, 13(5-6), 801-814. Cameron, G. T., Sallot, L. M., & Curtin, P. A. (1997). Public relations and the production of news: A critical review and theoretical framework. Communication Yearbook, 20, 111-156. Carroll, C. E., & McCombs, M. (2003). Agenda-setting effects of business news on the public’s images and opinions about major corporations. Corporate Reputation Review, 6(1), 36-46. Chemmanur, T. J., & Fulghieri, P. (2014). Entrepreneurial finance and innovation: An introduction and agenda for future research. Review of Financial Studies, 27(1), 1-19. Coddington, M. (2014). Normalizing the hyperlink: How bloggers, professional journalists, and institutions shape linking values. Digital Journalism, 2(2), 140-155. Danielian, L. H., & Reese, S. D. (1989). A closer look at intermedia influences on agenda setting: The cocaine issue of 1996. In P. J. Shoemaker (Ed. ), Communication campaigns about drugs: Government, media, and the public (pp. 47-66). Hillsdale, NJ: Lawrence Earlbaum Associates. Deuze, M. (2005). What is journalism? Professional identity and ideology of journalists reconsidered. Journalism, 6(4), 442-464. Gans, H.J. (1979). Deciding what’s news: A study of CBS Evening News, NBC Nightly News, Newsweek, and Time. New York: Random House. Golan, G. (2006). Inter-media agenda setting and global news coverage: Assessing the influence of The New York Times on three network television evening news programs. Journalism Studies, 7(2), 323-333. Hayes, A. S., Singer, J. B., & Ceppos, J. (2007). Shifting roles, enduring values: The credible journalist in a digital age. Journal of Mass Media Ethics, 22(4), 262-279. Heim, K. (2013). Framing the 2008 Iowa Democratic caucuses: Political blogs and second-level intermedia agenda setting. Journalism & Mass Communication Quarterly, 90(3), 500-519. Hermida, A. (2013). #JOURNALISM: Reconfiguring journalism research about Twitter, one tweet at a time. Digital Journalism, 1(3), 295-313. Johnstone, J. W. C., Slawski, E. J., & Bowman, W. W. (1972). The professional values of American newsmen. Public Opinion Quarterly, 36(4), 522-540. Kian, E. M., & Murray, R. (2014). Curmudgeons but yet adapters: Impact of Web 2.0 and Twitter on newspaper sports journalists’ jobs, responsibilities, and routines. #ISOJ Journal, 4(1), 61-67. Kovach, B., & Rosenstiel, T. (2007). The elements of journalism: What newspeople should know and what the public should expect (First revised ed.). New York, NY: Random House. Krippendorff, K. (2013). Content analysis: An introduction to its methodology. Thousand Oaks, CA: Sage Publications. Lariscy, R. W., Avery, E. J., Sweetser, K. D., & Howes, P. (2009). An examination of the role of online social media in journalists’ source mix. Public Relations Review, 35(3), 314-316. Lasorsa, D. L., Lewis, S. C., & Holton, A. E. (2012). Normalizing Twitter: Journalism practice in an emerging communication space. Journalism Studies, 13(1), 19-36. Len-Ríos, M. E., Hinnant, A., Park, S. A., Cameron, G. T., Frisby, C. M., & Lee, Y. (2009). Health news agenda building: Journalists’ perceptions of the role of public relations. Journalism & Mass Communication Quarterly, 86(2), 315-331. Lewis, S. C., Holton, A. E., & Coddington, M. (2014). Reciprocal journalism: A concept of mutual exchange between journalists and audiences. Journalism Practice, 8(2), 229-241. Meraz, S. (2009). Is there an elite hold? 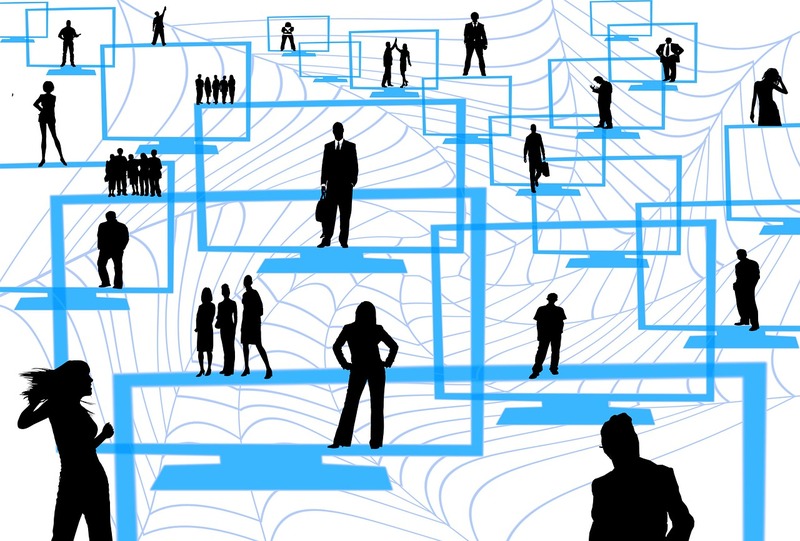 Traditional media to social media agenda setting influence in blog networks. Journal of Computer-Mediated Communication, 14(3), 682-707. Parmelee, J. H. (2013). Political journalists and Twitter: Influences on norms and practices. Journal of Media Practice, 14(4), 291-305. Pavlik, J. V. (2013). Innovation and the future of journalism. Digital Journalism, 1(2), 181-193. Reed, S. (2013). American sports writers’ social media use and its influence on professionalism. Journalism Practice, 7(5), 555-571. Reese, S. D., & Ballinger, J. (2001). The roots of a sociology of news: Remembering Mr. Gates and social control in the newsroom. Journalism & Mass Communication Quarterly, 78(4), 641-658. Reese, S. D., & Danielian, L. H. (1989). Intermedia influence and the drug issue: Converging on cocaine. In P. J. Shoemaker (Ed. ), Communication campaigns about drugs: Government, media, and the public (pp. 29-46). Hillsdale, NJ: Lawrence Earlbaum Associates. Shoemaker, P. J., & Reese, S. D. (1996). Mediating the message: Theories of influence on mass media content (2nd ed.). White Plains, NY: Longman Publishers. Shoemaker, P. J., & Vos, T. (2009). Gatekeeping theory. New York: Routledge. Willnat, L., & Weaver, D. H. (2014). The American journalist in a digital age: A first look. Paper presented at the International Communication Association Annual Conference, Seattle, WA, May 2014. Frank Michael Russell is a journalism doctoral student at the University of Missouri. He researches how journalists use digital technologies, particularly social media such as Twitter. From 2011 to 2013, he was the Knight visiting editor and assistant professor at the Missouri School of Journalism. Previously, he was an editor and writer for online and print, specializing in business and technology news. He worked for the San Jose Mercury News, The Seattle Times, Puget Sound Business Journal, and Los Angeles Daily News. He earned bachelor’s and master’s degrees in journalism and mass communication from San José State University. Worthy read. It makes me wonder about my Twitter habits and etiquette. Thank you for sharing this.